Under construction. JUST REDUCED! Why buy resale when you can buy BRAND NEW for LESS! Gorgeous townhome to be completed early to mid May 2018! This popular MIRELLA model floor plan features 20 FOOT CEILINGS open to 2nd floor LOFT, MASTER BEDROOM DOWNSTAIRS, lots of STORAGE closets, dark cabinetry, upgraded PENDANT lighting, GORGEOUS upgraded wrought IRON STAIR RAILING, ISLAND, light GRANITE COUNTERTOPS in baths and kitchen, screened lanai, and LARGE secondary bedrooms. Lots of LIGHT throughout, LOW E DUAL PANE windows, TAEXX pest control system, TILE throughout living/dining/kitchen. 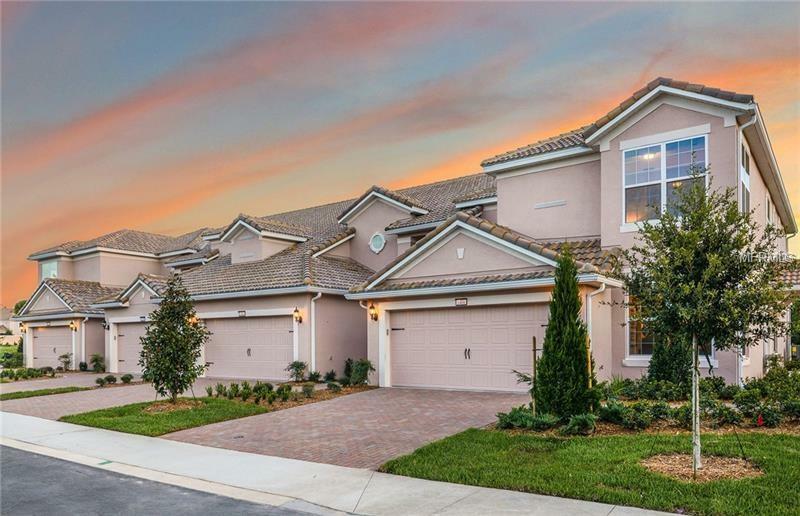 The luxury community of BellaTrae at ChampionsGate offers onsite HOA management, lifestyle director, 12,500 sf clubhouse, GUARDED/gated entrance, HEATED pool/spa, fitness center, yoga room, putting green, and bocce courts. HOA includes Internet, cable, lawn care, roof, ext paint, interior pest control, and above amenities. CDD bond has been satisfied for this home. Ownership is fee simple, not condo as the rest of Bella Trae. If it's a luxury lifestyle you're looking for, this townhome is for you! Pictures are for illustration purposes only, options may vary. This is your LAST opportunity for a NEW CONSTRUCTION Townhome. Final close out, last townhom! Make an appointment to view this home today!